#BGIB Takes A Trip... To Barcelona! The beauty of being an expat in Budapest means I can travel for cheap within Europe. So I decided to meet a friend in the beautiful Barcelona, Spain. This trip was totally done like a European. I packed light. I am able to travel more in a year by using my own travel best practices. I saved money by not picking my seat on the airplane, I booked the flight in advanced through skyscanner app. I only packed my backpack, which held 2 pair of jeans, 4 tops, a scarf, 1 pair of leggings and a pair of thin comfy sweats, I stuffed in my walking shoes, and laptop and was on my way. I used my Taxify app to schedule my pick up for my 6 am flight and was on my way to the Budapest airport! I met my friend, Tim at the airport and we took the Areobus for 5 euros each into the city center. We dropped our luggage in a luggage locker storage place. We then headed to breakfast and strolled aimlessly around the city center until our place was ready for us at 2pm. We then checked into our airbnb which had a phenomenal location, but I wouldn't recommend the place due to the smell of old pipes and cleaning supplies. For dinner we had tapas and sangria at Cuidad Condal which was delicious. We met a cute couple from Manchester at dinner and they took us to one of the oldest bars in Europe. The oldest bar somehow also meant the quietest bar in Barcelona, Boadas Cocktails. I even got sssshushed. I'm such a loud American. On our walk from our airbnb to the La Sagrada Familia, we realized that we were just steps away from Parc de la Ciutadella otherwise known as City Park. Did you know that there is an Arc De Triomf? And Barcelona passed on the Eiffel Tower, and the following year Paris picked up the idea and started breaking ground. Crazy huh? We continued our walk toward the La Sagrada Familia and stumbled upon this cute outdoor restaurant, El Rincon Criollo for Tapas. 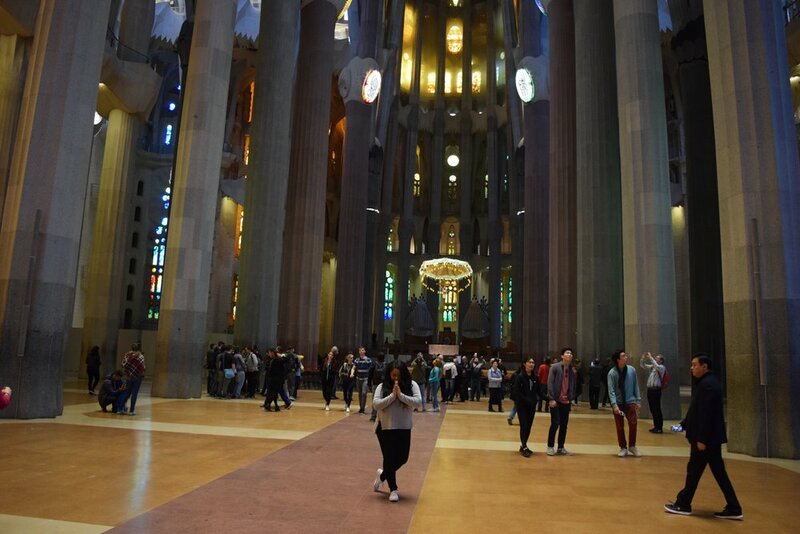 We went to the La Sagrada Familia. We could have saved a few Euros if we would have bought our tickets online, but lessoned learned. We loved it! We then ended our evening at the Collage Bar. It was fancy!! I must say. Great cocktails that were reasonably priced. This day we decided to go on a free walking tour with Sandemans, which helped explain the sites we strolled through during day 1. It was a great way to learn history and see the city. Here is a picture of the group we were with! Can you spot me? We took the city bus up to Parc Güell, where if you buy the tickets at the gate, you have to wait for your alotted time to enter the park. Once we finally got in, it was photoshoot time. We finished the night at Can Majo where the Paella was phenomenal. We paired it with artichokes, Croquettes, and of course Sangria. Talk about yum, and I of course found this place off of Yelp although Foursquare is widely used for reviews in Europe. . Below is a picture of the Lobster and Shellfish Paella. All in all I had a great time in Barcelona. We went during the month of March, so it wasn't quite beach season yet. We decided to settle for a stroll on the beach and the night time breeze was just perfect. If you're headed to this beautiful city you have to download Ed Sheeran's new track, "Barcelona" for the trip! "You'll be dancing through the streets, in Barcelona!" This song was literally on repeat. Did I miss anything? Please let me know what I should add to my to do list for the next time I visit.